Born in Syracuse, New York on June 25, 1929. His family moved to Stuttgart, Germany when he was six. He was drafted into the U.S. Army during the Korean War and stationed in Germany with the Second Armored Division as a mail clerk. The first book that Eric Carle collaborated on was Bill Martin Jr.'s Brown Bear, Brown Bear, What Do You See? Carle's first two books published on his own were 1, 2, 3 to the Zoo and The Very Hungry Caterpillar. 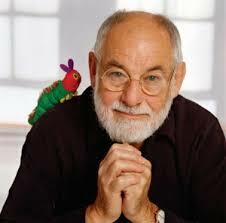 Since The Very Hungry Caterpillar, Eric Carle has illustrated more than 70 books.